It’s always a good idea to keep your eyes on your feet when walking in the CBD. 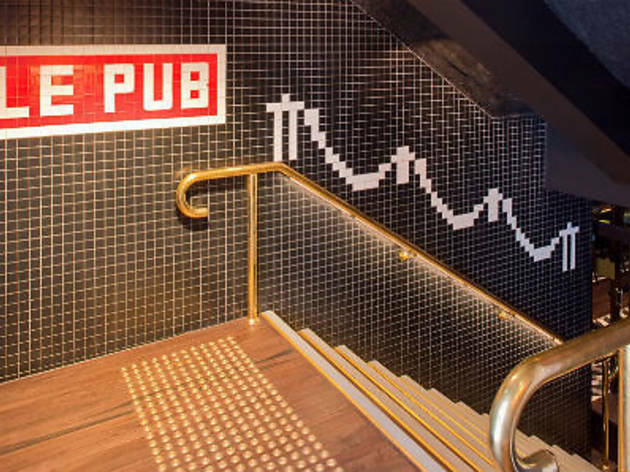 You may find lost money, you may save yourself from an embarrassing gum-shoe incident, and you may just stumble upon the entrance to Le Pub. In fact, there are two doors that lead down to this faintly French-themed venue – one is on York Street, the other on King Street. 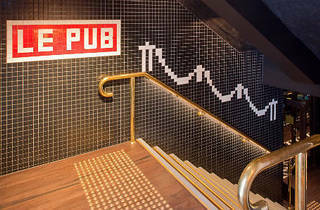 Unlike every other pub in the city – but quite similar to many small bars – you’ll find Le Pub below street level. The room is bisected into a dining area with table linens and a bar area – all the better to see the sports from. Considering our city’s love of al fresco imbibing they have made the underground space feel more inviting by installing light boxes on the ceiling that look like windows. Or you can huddle into one of the side booths and pretend to be a burrowing mammal as you watch people walk across the glass bricks overhead. Thirsty? Schooners of Stella Artois, Kronenbourg, Little Creatures pale or Leffe will sort you out. Hungry too? They do a steak special on Mondays, $20 pots of mussels on Tuesdays and a charcuterie board with thick-cut salami, jamon, duck rillettes, bread, dips and pickles any old time. This is a pub designed with comfort in mind. The staff are friendly, the TV volume turned low and the stools would easily seat a bison – no fear of a sore rump here.